An Exclusive Q&A with Rakuten Affiliate Network GMs Melissa Feemster and Adam Weiss, Celebrating Five Years as Blue Book’s Best Affiliate Network. Kicking off a milestone year, Rakuten Affiliate Network has a lot to celebrate. It was just awarded the top spot on mThink’s annual ranking of the world’s best affiliate networks for the fifth consecutive year. This year also marks the network’s twentieth anniversary since it launched in 1996 as a small New York City startup, LinkShare. At the time of its acquisition by Rakuten in 2005, it had established itself as a pioneer in affiliate marketing and the company has continued to push the industry forward. Being recognized as the best affiliate partner network by over 20,000 advertisers, publishers and agencies for five years running is an indication of Rakuten Affiliate Network’s continued leadership in innovation, reach, performance and service. This was confirmed to us as we analyzed the results of this year’s Blue Book survey. Among other notable findings, publishers praised Rakuten Affiliate Network for its strong support and training, while even smaller advertisers commented that the level of service provided was the best in the industry. The end result was not the very tight contest that we usually see between the two or three biggest CPS networks; this year, Rakuten Affiliate Network opened up a significant lead over its closest competitor. 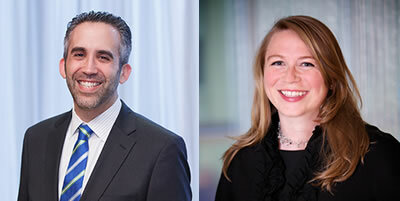 The network’s general managers Melissa Feemster and Adam Weiss shed light on what is driving the network’s ongoing success, the changing opportunities for affiliate marketers in today’s advertising landscape and how the industry will advance in the years ahead. Chris Trayhorn: What is the key to your continued success and leadership in the affiliate marketing industry? Melissa: First, we’d like to say, “thank you” to all of the clients, partners and stakeholders who advocated for us to earn this honor for the fifth year in a row. We especially recognize the value of the survey as one of the premier affiliate awards, given that it’s based on market input, not just market share. We attribute the success of Rakuten Affiliate Network to many factors, but the key nugget is our focus on maximizing the opportunity of affiliate partnerships for publishers and brands. This is especially important with the recent evolution of consumer behavior and of online marketing in general. Consumers are visiting more sites along the path to purchase, and affiliate plays an integral role within the funnel. Content has become part of consumers’ online and mobile journey, and is propelled by the rising influence of bloggers and social media mavens that have provided a venue to realize the actual potential of affiliate marketing. We help our customers find and build authentic relationships to ensure every affiliate partnership is mutually beneficial while adhering to strict network quality. Adam: Relationships are key. With our 20-year history in the industry, we have built an exceptional affiliate marketing community – one that connects advertisers and publishers to effectively work together to create meaningful opportunities for consumers. We have a strong affiliate platform, and we add significant value to that by being a hub for establishing strategic partnerships whereby advertisers can partner with publishers that have the right unique value propositions to promote everything from products, promotions and brands to their end consumers. Chris Trayhorn: How do you build your strong community? Adam: Direct relationships drive the community we’ve created, which is unique to our industry, and has a lot of appeal for advertisers – especially for those with strict brand standards. We have exceptional client retention because we are committed to evolving our business year after year in lock step with our clients. In fact, our top 10 clients have been with us for an average of eight years. We have very tenured advertiser and publisher account managers as well, who know benchmarks for best affiliate practices inside and out, and who excel at facilitating relationships that drive performance and ongoing collaboration. They are the lifeblood of the organization and manage some of the largest programs globally in online marketing. In the end, the survey results reflect our team’s hard work and we want to give them a huge shout out and thanks. Melissa: We have also established global events like Symposium and programs that bring advertisers and publishers together so that relationships and the community can be “live,” rather than just over email and the phone. In fact, our network invests in more global events than any other in the space, which is something we are very proud of. We frequently highlight advertisers and publishers that are innovating within our network on our blog and for awards within the community. We have always been advocates of the industry and believe that, as we all grow together, we push the channel to gain more recognition and, ultimately, earn more respect in the saturated digital marketing space. By highlighting accomplishments of our clients and victories within the whole industry, we feel that we are contributing toward this goal. Chris Trayhorn: What does innovation in affiliate marketing look like today? Melissa: Affiliate marketing has been around for 20 years, but it’s far from a mature market. The way online, social and device landscapes have evolved over the last five years provides fresh opportunities for affiliate marketing. Affiliates are a direct line for a brand to speak with consumers. More and more brands are leveraging the channel to push messages that are personalized, have high margins and are very intelligent, based on data across all of their online channels. We see our role as helping to facilitate that data exchange, and to add intelligence that brands cannot see in a silo – the network effect. Adam: There is also innovation in the emergence of new technology that supports a better understanding of affiliate performance, as well as performance beyond last-click, like O2O and upper-funnel initiatives, which includes brand awareness, new customer acquisition, and brand loyalty. As a broader funnel approach to affiliate marketing becomes more widely adopted, ad formats and technology have benefitted from the native format affiliate has always embraced. As advertising evolves on mobile apps, social networks and communication platforms, we will continue to see innovation around positioning affiliate marketing for those venues. The increasingly global reach of brands also drives innovation and spurs technology that facilitates payment conversions, language translations and other tools that enable global business. Rakuten Affiliate Network is the only network with a leading presence and significant market share in every key geography, and we are focused on continued global growth in 2016. Chris Trayhorn: Given the way that affiliate marketing fits into today’s online advertising landscape, how should people think about affiliate marketing as part of a marketing mix? Adam: We should view affiliate not only as a means of advertising, but really as native content on publisher sites. The channel has never been about disrupting consumers online. It exists to add value to content they consume and explore seamlessly. Today, this is even more important, as there is a higher standard for native advertising, and we’re well positioned to help clients use that to their advantage. Whether it’s a focus on highly visual content that is part of a story, or an offer that helps connect a consumer with a product or experience they want to buy, affiliate marketing creates valuable opportunities for advertisers and publishers to work together to create meaningful experiences for consumers. Affiliate marketing is an extremely effective strategy to drive consumer awareness and loyalty. To do this, we must harness the power of a network to accurately track and provide payment as a backbone to the relationship. Chris Trayhorn: What do you think is going to drive the next 5-10 years of affiliate marketing? Money has become concentrated in the past few years within affiliate – I see technology innovation changing the landscape to spread the wealth among more publishers and advertisers. Long-tail advertisers and publishers will enjoy a seat at the table. Affiliate will continue to integrate with omnichannel online efforts – attribution will help measure this and more sophisticated payment systems will allow for varied compensation options. Affiliate will be a key tool for digital companies to grow globally – with or without a physical presence – as publishers build their consumer audience without borders. Audience will become an even more valuable asset – the publishers who have it, who can build it or who can cut a list to target it, will come out on top. Commerce will be distributed beyond retailer carts for checkout, and affiliate should play a large role promoting card-linked offers and facilitating cart checkout on publisher sites. Chris Trayhorn: What were your core accomplishments in 2015? Adam: One of our biggest accomplishments in 2015 was improving transparency. As the first affiliate network to invest in mobile tracking, it continues to be a passion for us, so we were excited to launch the new Rakuten Marketing attribution tool, Cadence Essential, which brings transparency to affiliate performance and other Rakuten Marketing channels. Pairing this with an update to our global tools, we have seen tremendous growth with brand campaigns for companies across the retail, financial, hospitality industries and beyond. Further, we continue to make it easier for publishers to do business in the network by giving them the tools and reporting they need to easily leverage affiliate relationships for their business. We’ve seen a ton of engagement with bloggers and content publishers – all of which are highly coveted relationships for our brands and retailers. Chris Trayhorn: What is ahead for the Rakuten Affiliate Network in 2016? Melissa: More innovation, more new client partners, and more ROI for the channel – all with the goal of benefiting advertisers and publishers as we continue to stretch the boundaries of this industry! Operating as a division of Rakuten Inc. (4755: TOKYO), one of the world’s leading Internet service companies, Rakuten Marketing is headquartered in New York City, with additional offices in Australia, Brazil, Japan, the United Kingdom, and throughout the United States. Follow us on Twitter or learn more at http://rakutenmarketing.com.